I am writing this month's article in my break between Christmas and New Year. I am aware that, due to the publishing process, you won't be reading this until at least March. As a result of this time lapse, Christmas will be a distant memory and the festive spirit will have well and truly gone, so I won't go on about it too much! The last month has been mad and I was especially busy getting orders ready in time; whenever a deadline such as Christmas looms, things go like that. Throughout the year I find that most of my work is on a tight deadline - the turned component having been forgotten about or left to the last minute - but at Christmas time everyone wants their order in time for the big day, so this is always a very manic period for me. The work has been varied, as always, and as well as the usual mix there has been a lot of orders for fruit as gifts, along with turners stocking up on their finishes and abrasives for the holidays. I have also written out several gift vouchers for woodturning lessons, which make an excellent gift idea. The Wadkin lathe has well and truly settled in and I have been very pleased with its performance. Amongst the parts that came with the lathe was a sliding carriage; this sits on the lathe bed and slides along with a large handle on the front which turns a rack and pinion. There is a cutter mounted on the carriage which also moves on a cross slide - much like on a metal working lathe. This was an important feature for the pattern-makers who would have used this lathe, but I wondered if I would ever have a call to use it, so I stored it safely, just in case. I was contacted by a chap from Yorkshire who makes brushes and wanted some handles turning. He explained that he was struggling to get anyone to make them to his exacting standards and asked if I could help. "Of course"is my standard reply, so I made a sample and sent it off to him. 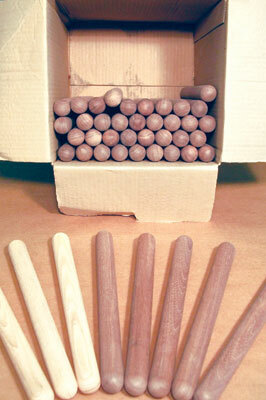 I should explain that these were no ordinary brush handles, these were seriously posh brush handles! Made in walnut (Juglans nigra) and turned to a sausage shape, 380mm (15in) long and 25mm (1in) thick. I made the sample the usual way, making a series of sizing cuts and cutting down to that level with a spindle rouging gouge, a planing cut, rolling the ends, then finally sanding them. He was impressed by the quality of my work and immediately ordered 50, promising that he was projecting orders of at least 50 per month, probably more! Having heard promises like this before I took it with a pinch of salt but was happy to take the order for 50. I decided that an order for 50 might warrant dusting off the sliding carriage and trying it out. "That's not proper turning,â€ I hear you cry, but when turning for a living, speed and accuracy are key and this tool - it is after all, just another tool - offers both of these. I sharpened the cutter and remounted it to offer an improved bevel rubbing cut and set it up to give me a finished 25.5mm parallel cylinder. The finish was surprisingly good and I quickly cut the 50 cylinders. I then removed the carriage - which like the rest of the Wadkin lathe, is made of cast iron and is very heavy - and power sanded the cylinders. The next step was to roll all of the ends over with the aid of my beading and parting tool. the decision to turn the ends of the handles with my beading and parting tool was an easy one. I always make it clear in demos and lessons that almost any tool can do almost any job; it just takes practice to master them. This is one of my favourite tools because it works just like a skew chisel but can also be used for sizing and cutting tenons, making it the perfect woodturner's chisel, and I use this more than any other when spindle turning. The problem for most hobbyists is that they don't want to 'waste' time practising with a tool, they want to get stuck in and make stuff. This is OK but it means you never get really good with a particular tool. The finest sportsmen and athletes constantly train and practise to improve, so why should it be any different for a turner? I decided that turning 50 half beads in each direction would make good practice; my main aim being to cut them accurately and quickly with the least amount of cuts and no catches, and I am pleased to report that there were none! A final sand and they were ready to pack up and send out. Before I had finished them the guy rang back and added some ash handles as samples for a future order. We will see if anything more comes of it. After the brush handles were gone I didn't expect to use much walnut for a while, but I had two more orders come in: one for a plinth from a regular artist client who wanted to mount a bust he was making, the other a Verger's rod with a hallmarked silver cross mounted on top for a church in Merseyside, where the rod was required for the church's centenary parade. 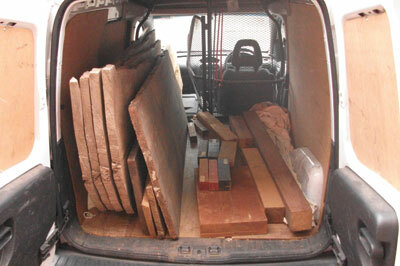 Walnut is not a wood I use that much, mostly because it is expensive compared to most other commercially available timber and there can also be a lot of waste because the percentage of sapwood is relatively high. That said, it is one of my favourite woods to use; it turns well and polishes beautifully with an oil finish. The vast majority of the timber I use is native or commercially imported from Europe or the USA; it is not often I use exotics but in the lead up to Christmas, I have made several gift items in various exotic species. Fruit is something I make to order throughout the year but this year orders for turned apples have gone through the roof. Apples really look good turned from exotics and being quite small the blanks are easy to buy and have very little impact on the environment. I was fortunate to buy a number of exotic blanks recently along with some boards of timber from a local woodworker, so several of his blanks were used up as apples, including some ziracote (Cordia dodecandra), palo santo (Guaiacum officinale), cocobolo (Dalbergia retusa), kingwood (Dalbergia caerensis) and Cuban mahogany (Swietenia macrophylla). 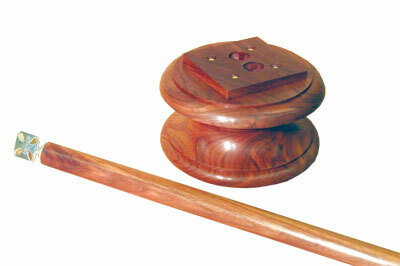 As a change from apples I was glad to get an order for a gavel and block. This was made in cocobolo to a very rough sketch and dimensions I was given on a scrap of paper. 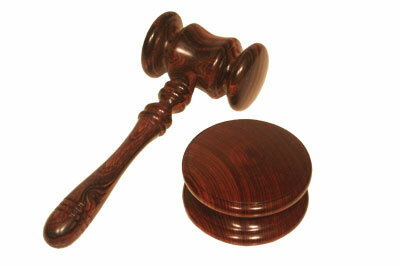 The cocobolo turned well and I was pleased with the result, which was oiled and lightly buffed. Over the last couple of months I have been in contact with a local joinery firm who are making a staircase for a large house in London. The client is demanding a very high spec and has asked for samples of everything the joinery company has made, including doors, skirting, architrave and indeed stairs. 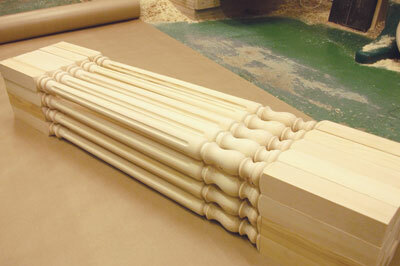 Eventually the staircase will include around 100 fluted softwood spindles and three and a half walnut newels with carved bases and newel caps. Samples have been going back and forth for a while now but we finally got the job. I regularly make stair spindles but, as I have mentioned before, they are usually in small quantities for repairs or extensions; this is the largest order I have had and I will be working on it over the next few weeks, drip feeding them as each section of stairs is completed. Thankfully the handrail they have ordered has a six-week lead time so it gives me a little breathing space. Throughout the year I try to stay as tidy as possible - in a small workshop you have to - but by the end of the year things can be getting rather cluttered and dusty, so I took the opportunity of the forthcoming break to do my annual Christmas clean up. I spent a day taking everything off of shelves, cleaning and replacing it in a more orderly fashion, anything that hasn't been used since the last clean up is considered for the bin and everything is generally dusted and vacuumed including the machines and the timber pile. The Wadkin and the tablesaw were cleaned down and greased and the whole place will be a joy to mess up again next year! Speed, accuracy and efficiency are all key to being a professional turner. That said, it is the quality of the final product that counts, so if an item needs to go back on the lathe or a extra few minutes needs spending on it to make it perfect, then I will do so without hesitation. Mistakes should always stay in the workshop.